Enjoy two steaks in one. The T-bone is a dual delight, the bone-in tender strip loin on one side and the sumptuous filet mignon (tenderloin) on the other. Flavorful and Delicious! 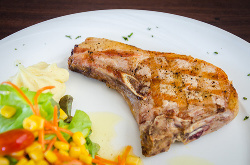 Our bone-in-pork chops are cut from the center of the pork loin. Richly marbled and aged to perfection, these chops are incredibly juicy and tender with a delicate, sweet pork flavor. At JSW Farm The Chop Shop an outstanding top of the Line cut is our standard. As our butchers strive for these standards, all weights are approx. while the taste will compare to none.